Here is a new take on an old favourite. Hark! The Herald Angels Sing is arranged in a jazz swing style. Happy, strong, up-beat and confident all come to mind when describing this Trumpet Quartet. Adding some percussion can only make Hark the Herald better. This could be as simple as hand clapping on beats 2 & 4. This arrangement would be fine for stronger players. 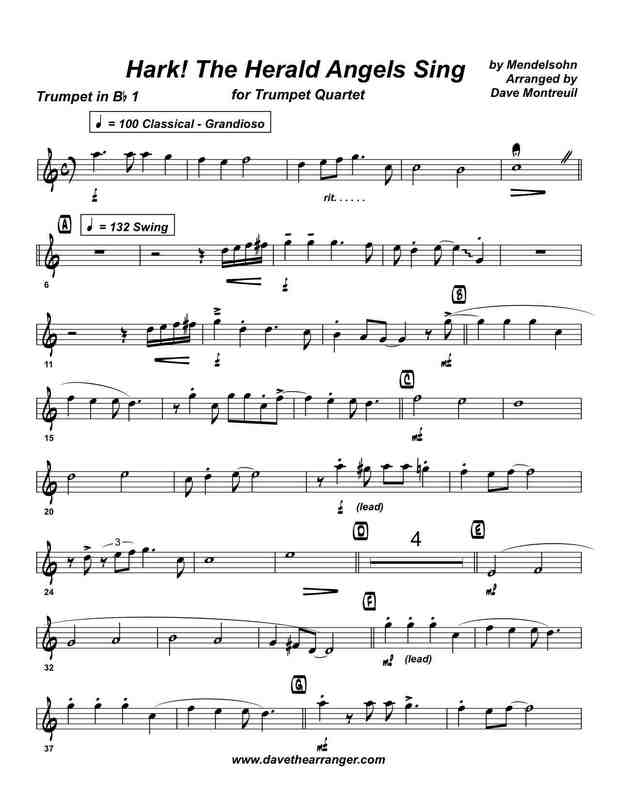 University or college level perhaps, but may prove difficult for younger players due to range issues.The lead trumpet voice goes up to an A (concert G) and can be a bit tiring (see the sample below). The second and third voices are fine in the middle of the staff. The fourth voice is on the low side and would require a 'low specialist'. It goes down to a low G (concert F) quite often. I couldn't put it in higher key, because I feel the first trumpet is already on the high side. And I couldn't transpose it lower, as I feel it is already too low for the fourth trumpet. This is the best compromise I could manage. Feel free to contact me with your thoughts! Right click here to download the playback for Hark! The Herald Angels Sing.